This Wednesday, FC Barcelona held the official presentation of Masia 360, a programme forming part of the strategic FCB Coneixement project. The highly emotional event was attended by over 600 athletes from the football, basketball, roller hockey, handball and futsal academy teams, plus coaches, teachers and hundreds of relatives at the Palau Blaugrana. Presented by Manel Fuentes, it was also attended by Barça president Josep Maria Bartomeu; the general secretary for sport, Gerard Figueres; the commissioner for sport from Barcelona City Council, David Escudé; FCB vice-presidents Jordi Cardoner, Carles Vilarrubí and Jordi Mestre; directors Silvio Elías, Pau Vilanova, Enrique Tombas and Xavier Vilajoana; CEO Òscar Grau and the director of professional sports, Albert Soler. Masia 360 forms part of the innovative and revolutionary strategic project called FCB Coneixement (FCB Knowledge), which the club is set to unveil shortly and is designed to ensure its leadership in terms of knowledge and coaching in connection to sport, bringing the future forward and reasserting FC Barcelona’s position as a global trendsetter. FCB Coneixement consists of two main projects, Masia 360 and FCB Universitas, which were recently presented in New York by Dr. Jordi Monès, the director commissioned to the FCB Universitas scheme. Masia 360, as explained at today’s event, wishes to make use of the knowledge that has been accumulated at the Club in different areas and over several decades in order for it to be of benefit to all athletes, trainers, coaching staff, families and other people involved with the athletes forming part of the five professional sections at FC Barcelona (male and female football, basketball, handball, roller hockey and futsal), regardless of whether they are still learning the sports, being consolidated as athletes, on the verge of turning professional, or already retired. 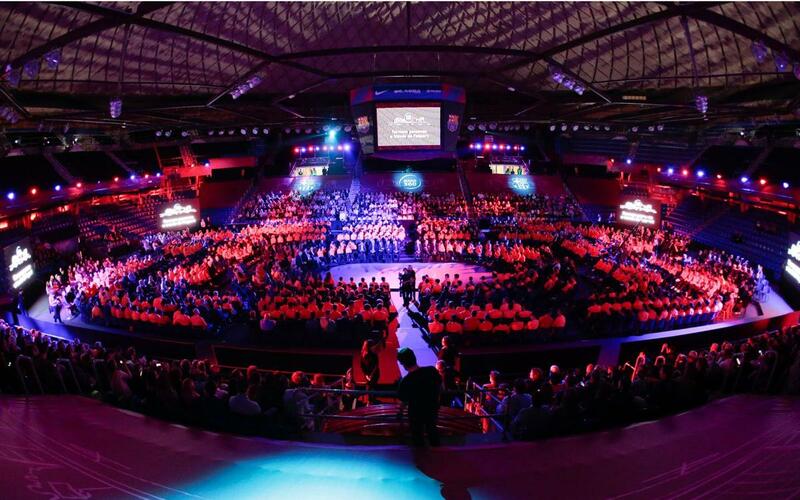 President Josep Maria Bartomeu welcomed the almost 2,000 people in the Palau and told them how the aim of this project is “to create people through sport … Education is our vocation. Masia 360, which is the development of La Masia, is an ambitious project to which we shall be dedicating many resources.” He also had words for the athletes’ families: “We know that you trust in us but I want you to know that from now on you shall have a team of professionals that will be taking it even further”. Carles Folguera, meanwhile, stressed the role that will be played by tutors and teachers, and the desire to create a Barça attitude: “We want to be the most educational club in the world, with the goal that whenever we talk about any girl or boy, who at any time came to form part of FC Barcelona, we can say, from the way that they train, they speak, they compete and they deal with life, that they have a Barça attitude. And most importantly, that they can say with pride that: ‘I am a Masia child”. Folguera highlighted that from now on, for example, a support teacher will be forming part of every trip to play in competitions that lasts for at least a week. He also explained that all injured players, once they have finished receiving treatment from the medical services, will attend academic support classes until the moment that the taxi leaves to take them home or their parents come to collect them. Today’s presentation also included appearances by Juan Carlos Navarro, Aitor Egurrola and Marta Unzué, the captains of the Barça basketball, roller hockey and women’s football teams, respectively; Marc Tolrà, from the Barça futsal team, and Gabri, coach of the U19 football team that’s currently top of the Division of Honour and its group in the Youth League. The Barça Lassa basketball team captain, the currently injured Juan Carlos Navarro, spoke of his fond memories of the time he spent in the academy: “I remember learning a lot in the youth teams and growing as a person. And I still have some good friends from that period”. There were also words from FC Barcelona CEO, Òscar Grau, a man who symbolises the philosophy of Masia 360 to perfection. He grew up through the club’s youth ranks as a handball player, and was in the first team for a decade, while also taking academic studies. He is now CEO of FC Barcelona after previously being the director of FCBEscola. The Barça football first team captain, Andrés Iniesta, was unable to attend the event because of the injury he suffered in Valencia, but also played his part in the form of a video looking back at his years at La Masia after arriving at the club when he was only twelve. In the clip, he encourages the 607 athletes involved in Masia 360 to make the most of the project “and continue to grow as athletes and as people”. Víctor Tomás, Barça’s handball captain, also sent a video message in which he encouraged the athletes to continue studying, just like he does. Carles Folguera concluded the event by telling the audience that the finest example of the Barça attitude is the gesture shown by the players in Sergi Milà’s U14 B team in Japan last August, when they consoled their opponents from Omiya Ardija after beating them 1-0 in the final of the World Challenge Cup. It was at this moment that Manel Fuentes called on Adrià Capdevila, one of the players that most consoled the weeping Japanese players that day, who was given a standing ovation by the 2,000 people in the house, shortly before proceedings were closed with the singing of the Barça anthem.